The dynamic duo that is Jono and Ben can be found everywhere in the media these days. When they're not on their own show, they're in the news for attempting to ride a banana boat across the Cook Strait, or some other such shenanigan. We caught up with the pair to find out what media they consume when they're not in it. What media do you wake up to? Jono: I wake up and watch cute videos featuring cats on YouTube - it gets my head in the game. Once I have had a jam on the cats it’s Stuff, Newshub, and the Herald. Paul Henry is on the telly in the morning while we are running around getting the kids ready. Ben: I wake up to an obnoxiously loud alarm on my phone in my hallway as it forces me to get out of bed to turn it off. On the way to work, I’ll flick through the breakfast radio shows for the talking and not the music, which is probably the opposite of most non-radio working people. What TV shows are you watching at the moment? How are you watching them? Jono: I watch a crap-tonne of Cime and Investigation on channel 71. I have watched so much I could literally commit the perfect crime. I am planning to rip off a casino soon! I also watch a disturbing amount of E Television. If you need someone on your pub quiz team who knows anything about crime or the Kardashians, I am your man. Our weekday TV night generally goes off MySky: Shortland Street, Home and Away, Newshub then Netflix. Ben: Well apart from all new Jono and Ben on TV3 Friday nights at 7.30pm? The TV does spend a lot of time on Disney Jnr thanks to my two young daughters and I’m also currently watching legal drama Suits on Lightbox and hooked on trashy Nashville on my Netflix trial. What music are you listening to at the moment? And how are you listening to it? Jono: Apple Music - got the $14 one, multiple devices baby what a playa! Ben: Lately I’ve been checking out Apple Music. Bananas don’t seem to have the same musical talent. What’s your favoured social media platform? Is it a blessing or a curse? Jono: I am personally not on Facey or Twitter, etc. I’m not against social media, I am just the most useless person on the planet. I always like looking over Ben’s shoulder when he is doing Twitter or Facebook updates (I think it may annoy him). The Jono and Ben TV Facebook page has taken off this year thanks to our social guy Olly and it has been an awesome way to get our content out to the world and an awesome way for people to connect with us and make fun of my bald head. Ben: Our Jono and Ben Facebook page has gone crazy popular for New Zealand standards recently, and for work I get amongst my own Twitter and Instagram accounts. Social media is cool to connect with people that like what we do, but can also quickly turn to anti-social media. It's official we're going to do something with our lives and attempt to break a WORLD RECORD! 30 Hours in a Bumper Car at Rainbow's End. Jono: Gossip around the office. Ben: My smartphone provides my much less smart brain all the news I need. What are you reading at the moment? How are you reading it? Jono: The last book I read was The Witches by Roald Dahl. Ben: I’ve been slowly reading The Martian on my Kindle. I also have a business idea for a chocolate egg which has a Kindle inside called a ‘Kindle Surprise’. Jono: The Postie Plus catalogue - they have a wide range of clothing for all shapes and sizes. Ben: I don’t really buy many magazines but do enjoy flicking through a two-year-old New Idea in a doctor’s waiting room reception. Jono: Newshub (good company, man) and Google Maps. Ben: Thanks to my little girls my phone is full of apps like Princess Palace Pets, Disney Royal Salon and Minnie’s Bow Maker. I can now choose the perfect matching outfit for Cinderella to go to the royal ball in every time. What’s your favourite radio station and/or podcast? Jono: I work on radio but I don’t listen to radio. The only reason is, I found in the past when I listened to other radio shows it would make me anxious about how good they were doing and how bad I was doing. So for 10 years I have tried not to listen to any other shows and just concentrate on what we are doing. I read an interview with Oprah who said she did the same thing, so basically I’m the white bald man version of Oprah. Ben: Why the Jono and Ben radio show, weekdays from 3 to 7pm on The Rock and/or the Jono and Ben podcast, thanks for asking. What’s your guilty media pleasure? Jono: E Channel! They keep you hooked with their teasers over the commercial break: “Coming up, why Kanye and Kim split over his affair. Find out next”. And then it’s bloody: “Kanye’s love affair with music is tearing them apart”. They get you everytime, I call them ‘anticappointments’. Ben: I say the kids are the main reason Disney Jnr is on, but sometimes I’ll find myself alone watching the end of Henry Hugglemonster to see how the episode turns out. What media do you go to sleep with? Jono: The media in my head recapping all of the fantastic hi-brow humour we have created over the day on multiple MediaWorks platforms. Online, radio and TV, did you know! Ben: I do like to fall asleep in front of the TV at night. I also get told by many people that my TV show is best for helping you go to sleep but there’s something about watching Jono before bed that gives me nightmares! 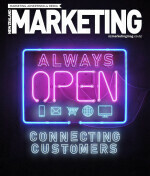 This article first appeared in the March/April edition of NZ Marketing.